Data compression utility, which allows you to quickly open, create, and modify your archives. It supports decompression and compression of files. the graphical user interface (GUI) provides access to Windows Explorer, a help menu, Options and a "Compress" button. 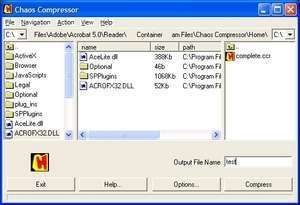 For security reasons, you should also check out the CHAOS Compressor download at LO4D.com which includes virus and malware tests. Additional screenshots of this application download may be available, too.